Painted Paradise, Zirkolika Prize for the best Circus of Sala or Carpa show of 2017. It was premiered during the Grec Festival 2016 and directed by Ferruccio Cainero. It deals with the drama of migrations and is a call to not sit still before any injustice. The jury has valued the control of the rhythm of the artist, the staging of the show, the great talent of the clown on stage and a socially committed work that shakes consciences and offers impressive images. Since its creation, in 2010, the Night of Circus has become an appointment for the entire sector. Its objective is to promote the circus and at the same time dignify and contribute to the professionalization of the sector and the artists and companies of the Catalan circus. National Award of Culture 2014 Of the National Council of Culture and the Arts. The National Awards of Culture – National Arts Awards are the most important distinctions in the field of culture in Catalonia. The National Council of Culture and the Arts (CoNCA) is a body set up by the Parliament of Catalonia that is made up of leading figures in the cultural and artistic milieu, and which, since 2009, it awards the distinctions bestowed by the Government of Catalonia, the Generalitat de Catalunya. The National Awards are granted to individuals, organizations or institutions of any area in the world that deserve institutional recognition for their singular contribution to Catalan culture, its enrichment and its enhancement. The Awards specially value notions of excellence, innovation, trajectory and projection, whilst having in consideration the contribution during the year preceding the award. CoNCA aims to distinguish innovation, continuity and excellence. The National Awards of Culture 2014 vindicate creativity as a veritable symbol of a country with such cultural dynamism that is a constitutive part of its historical personality. Culture and civil society are, in Catalonia, one axis of past, present and future. Pepa Plana receives The National Award of Culture for her established and consolidated career, as well as for the remarkable international tour with the show Penèlope and her recent participation in the Cirque du Soleil. She conveys the object of feminine laughter. She embodies the woman clown, the female universe from the standpoint of feminine humour in a circus often dominated by males. “Clown of the Year” Award 2013 at the Fira del Clown in Vilanova de la Muga. La Fira del Clown is a Festival that fills the streets of Vilanova de la Muga and which includes performances by female clowns, male clowns, music, circus and theatre. This festival was conceived to provide an exciting and diverse program that would appeal to all audiences and ages. This year, and as part of the Festival’s second edition, an award ceremony to nominate ‘The Clown of the Year 2012 and 2013′ was held. This award recognises initiatives, projects, activities and professionals renowned for their importance, trajectory or impact on the world of clowning. The ‘Clown of the Year’ is an honorary award without a cash prize, however its importance resides on the fact that the organising committee of the Festival itself decides the winner. Pepa Plana receives the Clown of the Year Award 2013 in recognition for her career, her performative qualities and charisma on stage, as well as to highlight her important work in pro of women Clown and the projection of Catalan language in her latest show with the company Cirque du Soleil. Sabatot Alegre Award, 9a Setmana del Pallasso (9th Clown Week) Castellar del Vallès 2011. The Sabatot Alegre is an award that honours initiatives, projects, activities and professionals that stand out for their importance, trajectory or impact. It was established in 2005, and from that first step Sabatot Alegre has never stopped to stride forward. In 2011 Pepa Plana was the artist considered to deserve such an honour. She is a female clown, renowned for her brilliant career right from the beginning, which stands out for her quality and charisma on stage. Of note is her important task in pro of female clowning, having directed the five editions of the International Female Clowns Festival that have taken place in Andorra. The Circus awards Zirkòlika of Catalonia were established in 2010 with the aim of building up awareness about Catalan circus creativity and production. Such a public and mediatic acknowledgement was intended as a testimony to the genre’s high level of artistic quality within the different disciplines of contemporary practice. The Zirkòlika awards have achieved significant media coverage. They are organised by the association Zirkòlika; a project dedicated to the dissemination and communication of Circus Arts. Since 2004 Zirkòlika publishes the only magazine specialising in circus, as well as maintaining a comprehensive portal online that includes a calendar of festivals, a listing of events and shows, a circus library, as well as news, reports and general information about the genre. ARC Award 2004 in the Circus category for the show “Giulietta”. The ARC AWARDS are widely regarded as the benchmark awards for live music and spectacle in Catalonia. ARC (Association of Professional Agents, Promoters and Managers of Catalonia) is a non-profit organisation that has its origins in 1976. It was created by a group of agents of Catalonia and the Balearic Islands with the intention of uniting their professional interests whilst, at the same time, providing solvency and a solid reputation to the profession. 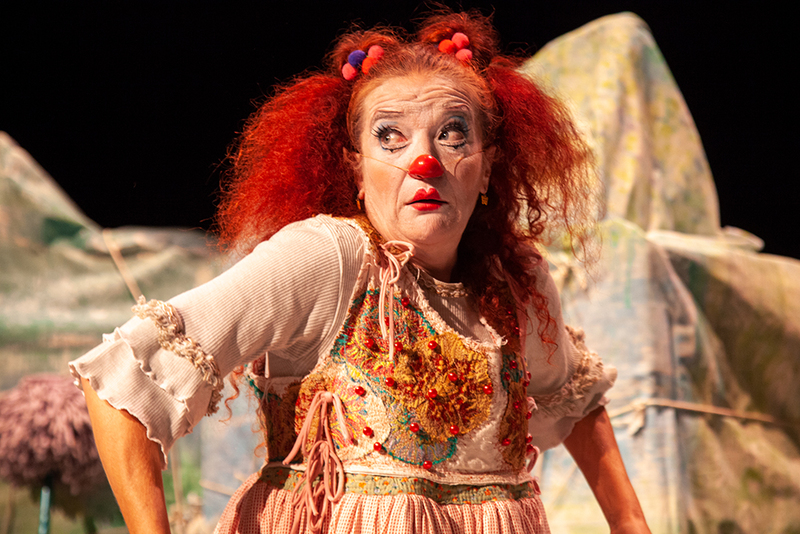 Honorary Mention for the show “Giulietta” in the IX International Clown Festival of Cornellà. Aplaudiment FAD Award 1999 for the show “De Pe a Pa”. The FAD Sebastià Gasch Awards were established in 1976 to distinguish the most outstanding theatre-related projects and performances of the season, as well as recognising all those professionals that propose different and innovative practices in show business. Since then, the jury, made up of an heterogeneous group of people eager to follow up original proposals, ideas and projects as well as the careers of its protagonists, is renewed periodically. After attending as many shows as possible throughout the season, each member of the jury argues for his or her chosen productions or individual performances until an agreement is reached; a sincere attempt to recognise something special: limitless creativity. The Aplaudiment Awards is a distinction awarded to a person, creation or entity who has been particularly outstanding in some especially relevant aspect of their work.